Captain Kumar Sangakkara top-scored with a brisk 75, while Mahela Jayawardene and Thilan Samaraweera also hit half-centuries, as Sri Lanka took the honours on day one of the third and final Test against India, at the P Sara Oval in Colombo, on Tuesday. Pragyan Ojha bowled with great discipline to register impressive figures of two for 78 in 26 overs, including the vital wickets of the in-form Sangakkara and Jayawardene. Tillakaratne Dilshan started off nervously before settling down hit to a steady 41. He was unforunately run out in the final over of the morning session, courtesy some sharp work by Murali Vijay at silly point. Sangakkara, who was dropped on 23, stroked a brisk 75 before he holed out Pragyan Ojha to Virender Sehwag on the long-on boundary. He hit five boundaries and two sixes in his 114-ball knock, adding 55 runs for the third wicket with Jayawardene, who scored a patient 56 from 154 balls. Earlier, Sangakkara continued his luck with the toss and again elected to bat. Veteran Sachin Tendulkar created another world record as he featured in his 169th Test match, surpassing Steve Waugh for the most number of Test appearances. Sri Lanka lead the series 1-0 after winning the first Test by 10 wickets, while the second ended in a high-scoring, dull draw. It was not a bad toss to lose for India, as the pitch offered a great deal of assistance for the seamers in the early overs. Tharanga Paranvitana got the innings off the mark in some style when he drove a full delivery from Abhimanyu Mithun down the ground for a boundary in the first over. Ishant Sharma took no time to get into his stride and beat Dilshan in his first over and even got an inside edge that missed the stumps and went for a boundary through fine leg. The lanky pacer, however, struck the first blow for India, claiming the wicket of Paranavitana for eight. The left-hander tried to drive an outswinging delivery but only edged it and was caught behind by wicketkeeper Mahendra Singh Dhoni. A confident Ishant gradually increased his pace and consistently troubled the batsmen, paerticularly Dilshan, with sharp movement and bounce. Dilshan curbed his usual natural instincts and was content to wait for the odd loose deliveries. But still he could not be kept quiet for long and hit Ishant for back-to-back boundaries through the off-side in the eighth over. Sri Lanka reached 36 for 1 after ten overs before India introduced spin early in the form of Amit Mishra. The in-form Kumar Sangakkara was quick to prove a point to Mishra and charged him down the ground for a boundary and six in his second over. Mithun came on for his second spell and immediately should have claimed the big wicket of Sangakkara (23) in the 16th over. He managed to induce an edge, but VVS Laxman at second slip dropped an easy offering after Suresh Raina came in the way and distracted him. Sangakkara had scored back-to-back centuries in the series, including a double in the previous match, and surely would make India regret the lapse. The pain of that let-up was already being felt by the Indians as Sangakkara slammed Mithun for consecutive boundaries through the off-side in the 22nd over. It seemed the same old story for the Indian bowlers, with Sri Lankan batsmen dominating and scoring at will. But the visitors found some joy in the final over of the session when Dilshan was run-out. Dilshan, who scored 41 from 70 balls, was caught unaware and short of his crease as Murali Vijay stopped the ball at silly point and threw it back to Dhoni, who whipped the bails off. At lunch on the opening day, Sri Lanka were 102 for two in 24.3 overs. Sangakkara's dropped catch was hurting the Indians, as he completely took control to score 48 from 65 balls, inclusive of four boundaries and a six. Ishant bowled a superb spell with the new ball to claim one for 20 in seven overs, but Mithun was expensive as he went for 39 runs in nine overs. 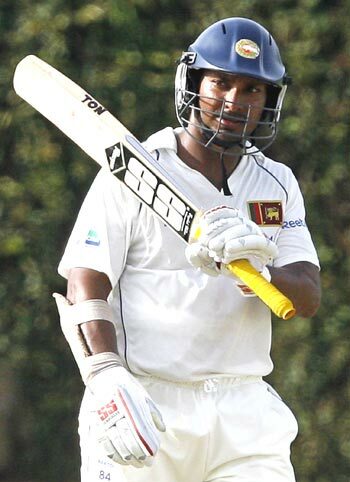 Sangakkara brought up his half-century from 69 balls with a single off Ojha in the third over of the session. And a few deliveries later charged down the wicket to Ojha and slog swept him for a huge six over midwicket. Mahela Jayawardene also looked in good touch right from the start as he hit Ishant for a boundary each in back-to-back overs. Mithun had a confident leg before wicket appeal turned down when he struck Jayawardene on the pads with an incoming delivery, in the 34th over. With the pitch drying a bit, the spinners, especially Ojha, were getting the odd ball to turn and bounce and this was as early as the second session on day one. Sangakkara also survived a close leg before shout against Ojha as the ball struck him high on the pads, in the 39th over. But the left-arm spinner had his man a couple of overs later when the batsman holed out to the long-on fielder after a good innings of 75, having hit five boundaries and two sixes in his 114-ball knock. While Ojha stuck to a good line and length, Mishra struggled to find his bearings. Thilan Samaraweera helped himself to a couple of boundaries through the mid-on region as Mishra bowled it full and straight on the batsman's pads. Sangakkara's wicket though slowed down Sri Lanka's run rate as boundaries dried up. At tea, Sri Lanka were 194 for three in 55 overs, with Jayawardene unbeaten on 39 from 104 balls and Samaraweera not out on 18 from 36 balls. The Indian bowlers came up with an improved performance in the second session and never let the Sri Lankans score freely, as has been the case in this series so far. Ojha utilised the conditions well to claim one for 55 in 15 overs and Ishant took one for 33, while Mithun bowled without much success for 47 runs in 15 overs. Samaraweera started off with a boundary after the break when he played a wide delivery from Ishant through the thirdman region. With the Indians spreading the field around for the spinners, the boundaries were hard to come, even when loose deliveries when were on offer. While Jayawardene was content to play the waiting game, Samaraweera tried to break the shackles and danced down the wicket and drove Mishra through midwicket for a boundary. Ojha was finally rewarded for his persistence when he had Jayawardene leg before wicket. The right-hander, who scored a patient 56 from 154 ballsm, with the help of three boundaries, was unfortunate to have been given out as he had taken a big stride forward; Hawkeye confirmed that the ball would have bounced over the stumps. While Ojha was having a good time with the ball, Mishra struggled to make an impression and kept bowling no-balls. Meanwhile, Samaraweera hit his second consecutive half-century off 112 balls, inclusive of five boundaries, in the 77th over. India decided to force the issue as they took the new ball after 82 overs with the spinners unable to make much of an impact. Angelo Mathews was happy with the extra pace on the ball as he hit a boundary each off Mithun and Ishant in consecutive overs. However, it was not long before the umpires offered the light to the two batsmen, who took it without any hesitation. Sri Lanka closed the day on 293 for four in 86.5 overs, with Thilan Samaraweera unbeaten on 65 from 143 balls and Angelo Mathews not out on 26. For India, Ojha led the way, claiming two for 78 in a disciplined 26-over spell, while Ishant took one for 49 as the visitors employed a defensive field for most of the day. Unlike the previous two Tests, it was not a run feast for Sri Lanka, who adopted a wait and watch approach. In the end, they would be quite delighted at having put up the total they did on a pitch already offering a great deal of assistance to the spinners.